Dr. Ahn is a dedicated orthodontic professional, not only to align the teeth but also to make her patients happy and confident. She maintains ART(aesthetics) and SCIENCE(function) in balance. She puts utmost effort to satisfy every patient's needs to deliver the best result at comfortable and enjoyable atmosphere. The office is equipped with the newest, most advanced technologies, complemented by effective personalized orthodontic techniques that Dr. Ahn is continually re-inventing. Her previous experience as a general dentist provides her with a comprehensive view of dental concerns while treating for her patient's orthodontic cares. She upholds professionalism as an orthodontist while giving a full consideration to general dentists or other specialists' opinions. She has served as an instructor at Korean Orthodontic Research Institute(KORI), which has originated at Charles H. Tweed Internationale Foundation, Tucson AZ. She has given orthodontic lectures and typodont courses in Korea, China and USA. She pursued Advanced General Dentistry at Dental School, University of Maryland, and Graduate Orthodontic Program at Indiana University Dental School dedicated in Orthodontics. Dr. Ahn offers services to all ages of patients; she would love to take you on an orthodontic journey to transform your attitudes toward life to a higher state of self-esteem with beautiful, healthier smile. ​Digital Panoramic & Cephalometric x-rays are some of the new technologies used in dentistry to instantly view your x-rays and enlarge the image. These images are one big picture of your entire face from the front and from the side to better understand your case. Our digital technique allows us to take images of your teeth including facial structure that can be viewed and examined on our computers immediately. There is no waiting for the images to be developed and the doctor can zoom and enhance the images for a more accurate diagnosis. You and Dr. Ahn will also be able to aid in the identification of dental problems and to gauge your dental health. The digital x-ray uses less radiation in comparison to conventional radiography, making this technology both safe and efficient. Dr. Ahn will use these information to create an individualized treatment plan​. ​Our office features the most advanced Cone Beam CT Scanner for patients who needs more information about his/her status. It provides us with images deep inside the bone for specific reason. This allows us to detect any problems underneath the teeth. 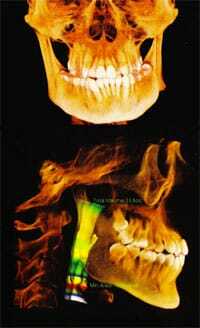 Our CBCT has a 8X15 Field of View, which provides the 3D images from right below the eye to the Hyoid bone(neck). With this large image, we can even measure the volume of nasal and oral cavities to detect any potential airway problem, such as obstructive sleep apnea(intermittent airflow blockage during sleep), mouth breathing, and etc.. It also shows maxillary sinus with parts of nasal cavity to detect the sign of sinusitis (sinus infection). iTero Element® 2 delivers faster scan processing, enhanced ergonomics, and high-definition color imaging, making it the perfect partner for the modern practice. Intraoral scanners from iTero scan the mouths of patients, capturing images to create three-dimensional dental images in minutes. ... Intraoral digital scans from iTero scanners can be easily shared with other dental professionals and third-party providers such as Invisalign.